Linapacan was our second choice for our Palawan getaway. We originally planned on going to Balabac, but due to weather constraints and the threat of being eaten by crocodiles, we whole-heartedly settled for the latter. And can we be so choosy? 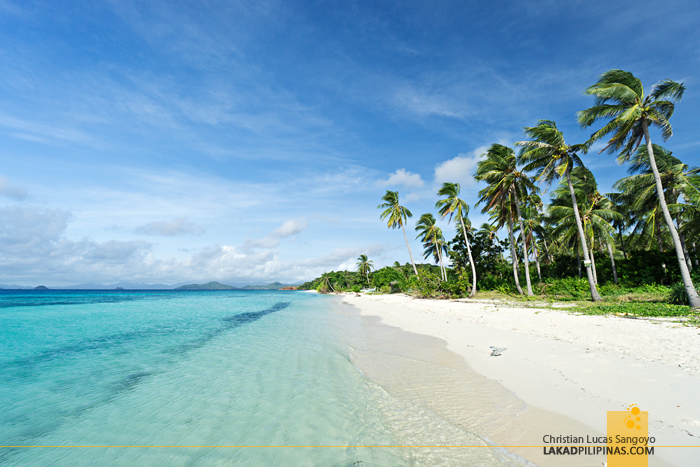 Linapacan has been tagged as having one of the clearest waters in the world! 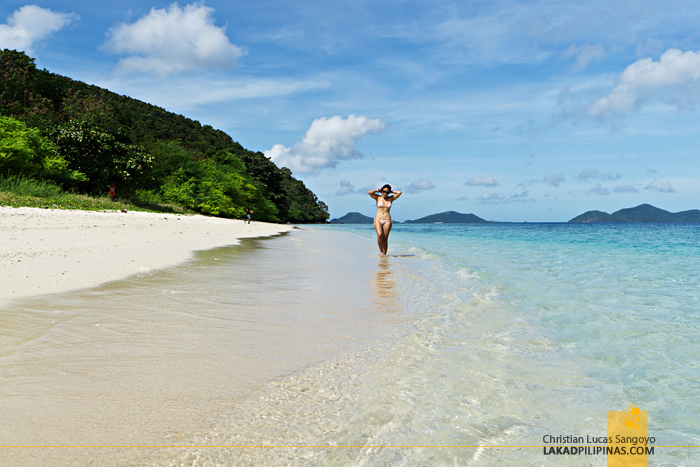 Located between El Nido and Coron, Linapacan is actually a municipality in Palawan. 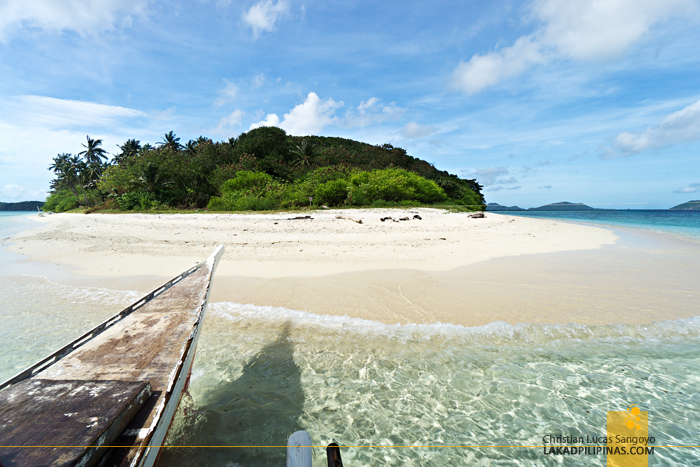 It is a menagerie of islands, some of which used to belong to Coron. 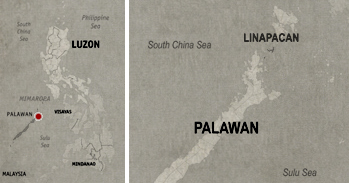 The town’s jump off is about an hour away from El Nido, and I’m quite puzzled as to why the boom in the region’s tourism hasn’t reached it yet. 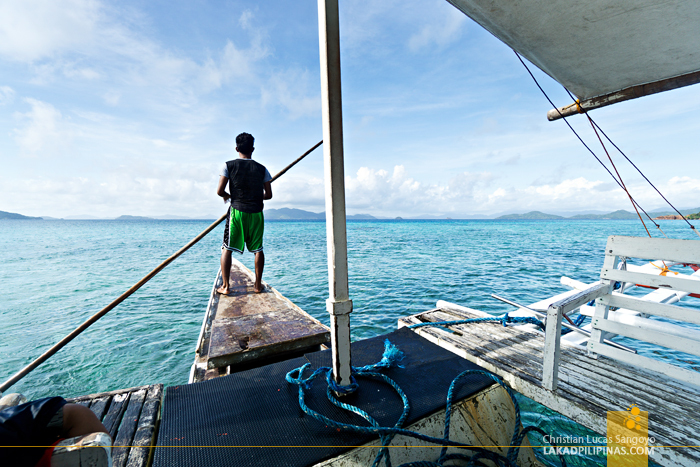 We travelled to Linapacan from the Northern Hope Inn in El Nido early the next morning. Like four in the morning early. A quick stop at a carinderia hawking freshly cooked dishes, about an hour of snooze time inside the jeep, and we arrived at our jump off in Sibaltan for our Linapacan island hopping adventure. Our boat wasn’t ready yet when we arrived, giving us time wander along the shoreline fronting a few resorts in the area. Sibaltan is still part of El Nido, its eastern coast, to be exact, and it’s totally wilder and more untamed than its western counterpart. STARTING OUR LINAPACAN ISLAND HOPPING TOUR! 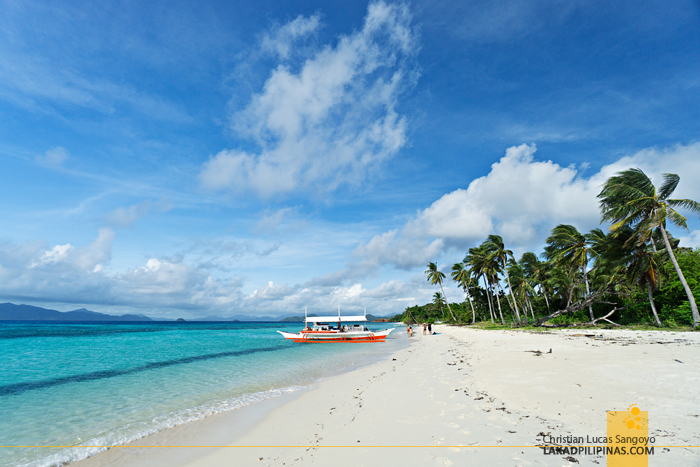 Northern Hope Tours organized our Linapacan island hopping. They really don’t offer this tour package yet when we went to El Nido, but Ate Neriza, the tour agency owner, was kind enough to make it happen for us. Should you wish to avail of their tours, you may contact them using the details on the footer of this article. Our first stop took about an hour to reach. The weather was fine, but still, we endured being splashed by saltwater en route to Maosonon Island. It was all worth it though. 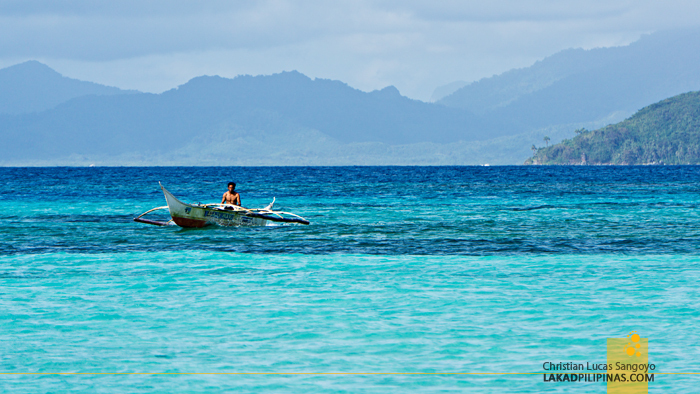 We were already snapping away with our cameras as our outrigger boat slowly approached the island. Maosonon is a private island, so we were asked to pay a fee upon alighting from our boat. Again, it was worth it. The sand was blinding white and the water, the perfect turquoise. There were hardly any waves and I was torn between dumping my cameras on the shore and swimming across the blue green waters, and taking pictures. Triangular in shape, it’s one of the southernmost islands in Linapacan. Two of its sides has beaches, the south side finer than its northern counterpart. 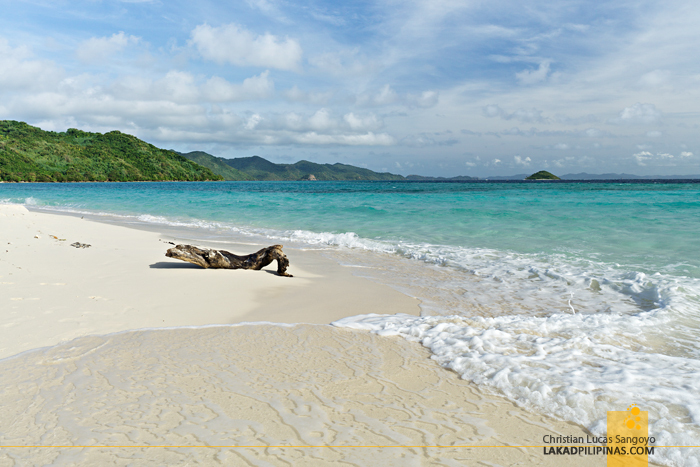 Both beaches meet on its southwestern tip, pointing to a small islet that can be accessed by foot during low tide. We were told that beach-goers can actually camp here for the night. And we would’ve done so if not for our short stay. Maosonon Island was definitely a good preview of what’s in store for us in Linapacan! A hundred meters or so from Maosonon Island, our boat stopped in the middle of the sea, a ladder was deployed down the water and we were asked to jump. And jump we did. We were more than ready to go snorkeling in Linapacan! 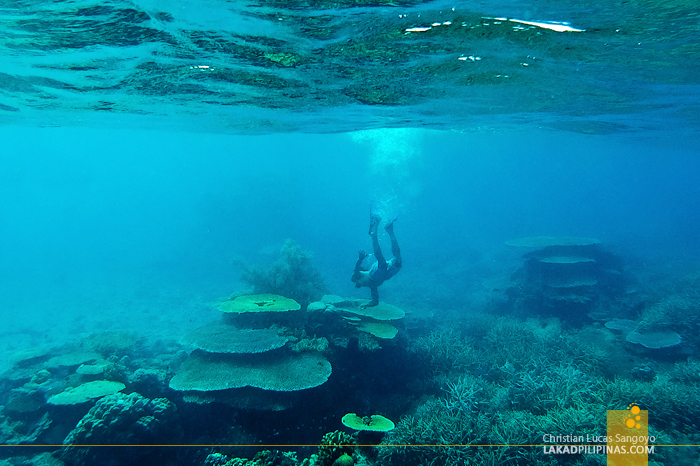 With my full-face mask on, I dove down the warm waters of Linapacan and found a thriving underwater garden. Clarity wasn’t a hundred percent on the mark, but it was enough for us to appreciate West Maosonon Reef’s huge and colorful corals. The snorkeling spot was quite deep, about fifteen to twenty feet by my estimate, and the current was a bit strong. Most of my friends went immediately back up after a few minutes, unable to swim far due to the current. Good thing I brought my fins with me—although it was still hard to maneuver even with it on. An hour and half later and we were again docking on another island, this time at Cagdanao Island. 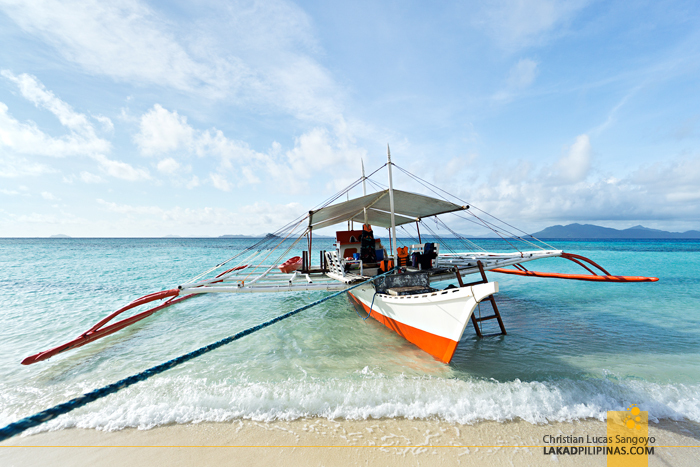 Throughout the duration of our trip, we met only two boats carrying tourists aboard, foreigners taking the slow overnight boat trip from El Nido to Coron—Linapacan is truly not yet on the tourist radar. We didn’t even see any boat-paddling kayaks around! 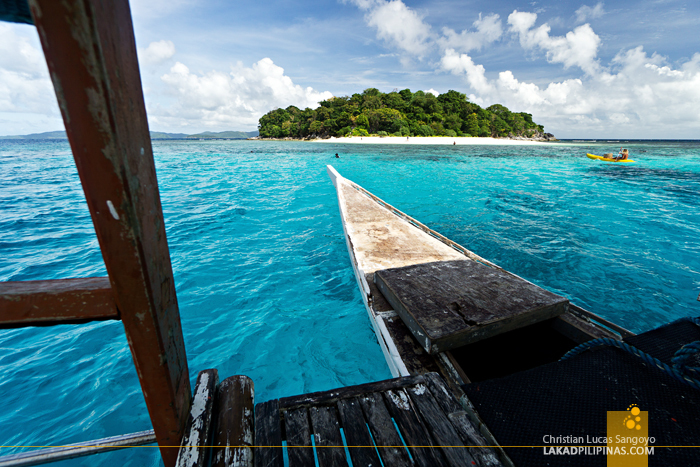 Cagdanao is a heart-shaped island off the western side of the Linapacan mainland. We can actually see the mainland from where we were. 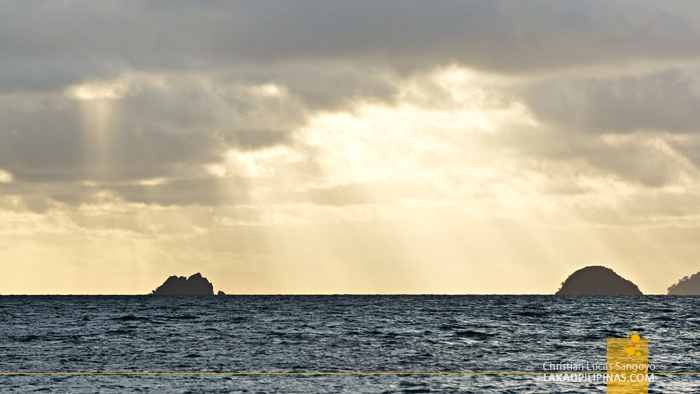 And as with Maosonon Island, it was heartbreakingly beautiful. The sand was impeccably white and the water was luminously clear. 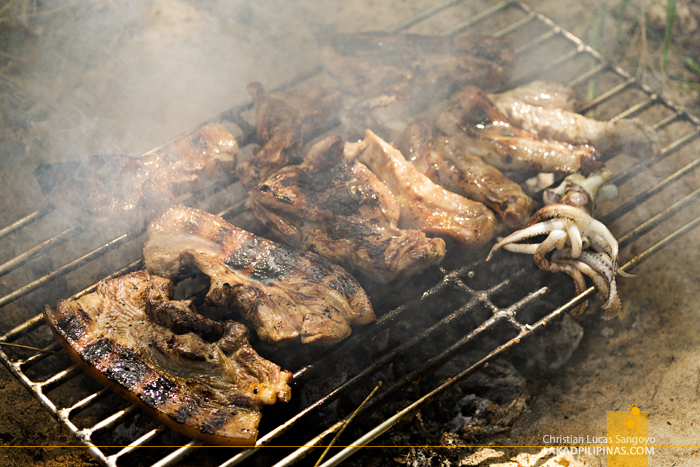 Our guides started cooking lunch while we headed to the waters to check if it holds any surprises. And we were not disappointed, just a few meters from the shore, clusters of corals replete with small fishes started to break into view. 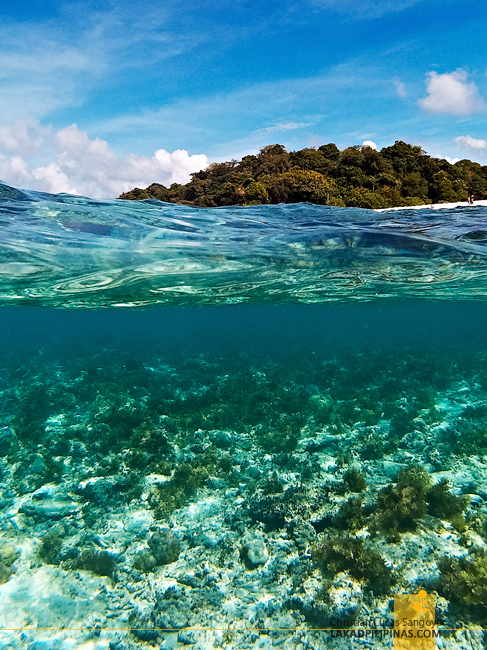 The depth was about four to six feet, definitely a good snorkeling area for beginners. 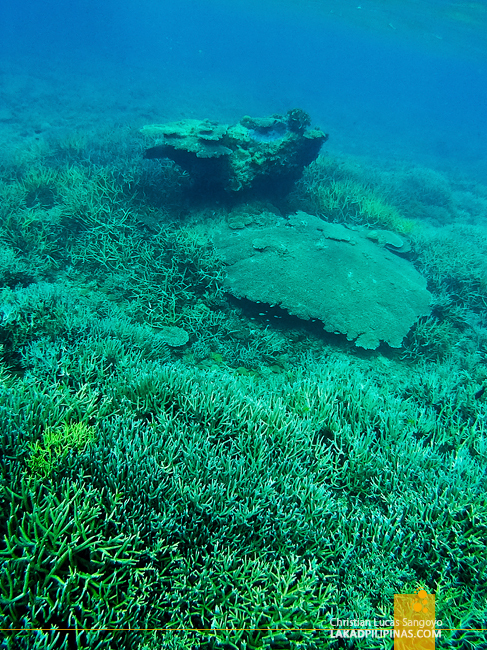 The seabed drops to an unimaginable depth as I went further out. Not a fan of swimming without seeing the seabed, I went back to the safety of the shore. And just right on time, our lunch was ready. An island meal at Palawan is, of course, not complete with the signature boatmen presentation complete with carved LINAPACAN letters on the cucumber. 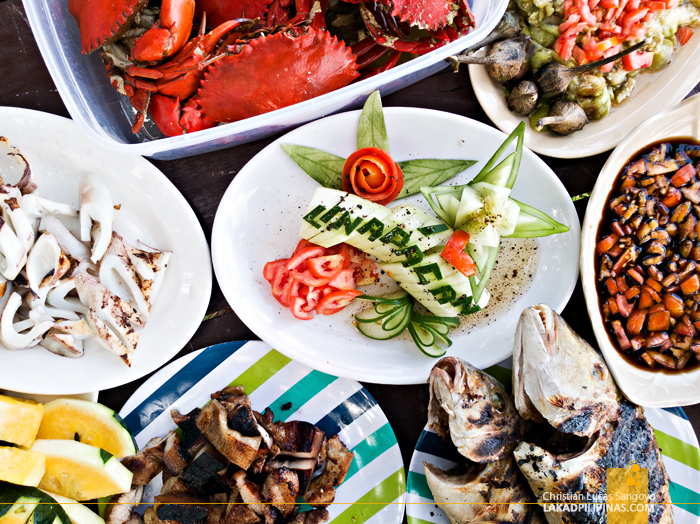 It was a feast of grilled squid, fish, ginormous crabs, grilled pork liempo, eggplant ensalada, and a platter of fruits. Our boat passed by Lacalaca Island, a small islet about three hundred meters away from Cagdanao before we headed towards our final destination. We were actually given a choice by our guides if we wanted to dock, but since everyone was too full from lunch and the heat was unbearable, most of my companions begged off—to my utter disappointment. I wanna go down! A few minutes into the sea and we again stopped just right before Ginto Island. It was snorkeling time once more! Everyone just wanted to lay down and nap by this time, but not me! I immediately jumped into the water and found the best snorkeling site in our Linapacan island hopping tour! The reef wasn’t that deep, there was no current, and clarity was perfect! 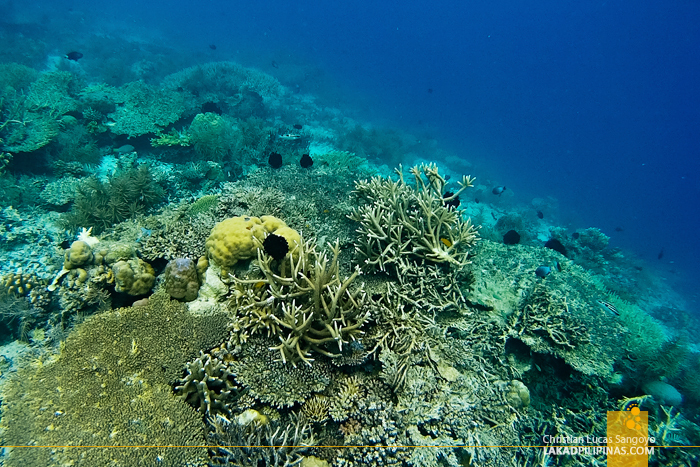 Ginto Reef wowed us with a profusion of corals and fishes, literally within the reach of our hands. The whole seabed was exploding with colors! 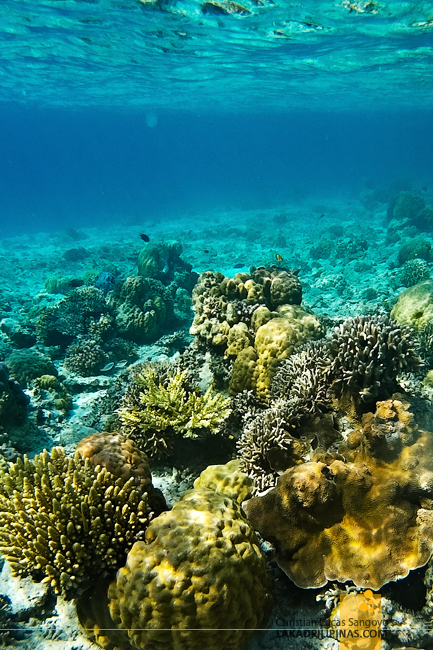 Soon, everyone was swimming along the reef, their afternoon siesta forgotten. How can you even think of missing this for a nap! 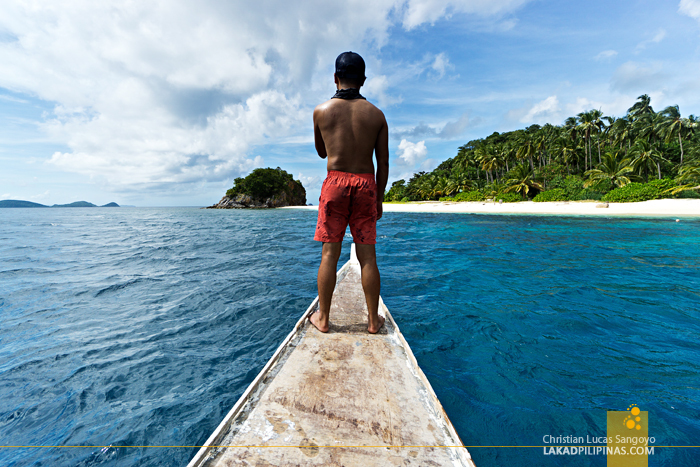 Linapacan’s reputation as having one of the clearest waters in the world is definitely on point! 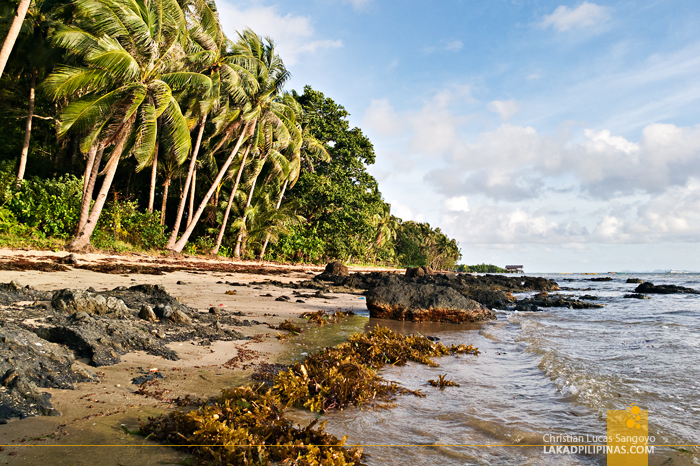 ~ OUR LINAPACAN ISLAND HOPPING WAS MADE POSSIBLE WITH THE HELP OF NORTHERN HOPE TOURS. VIEWS & OPINIONS ARE ALL MINE. Hello! How much did this tour cost you (including transpo)?